Scandinavian almond cake with butter rum glaze is easy to make and oh so yummy! The warm glaze over the warm cake is a perfect dessert anytime! Almond cake is arguably a northern recipe. No one knows if the Swedes or Finns brought it to the States, but each claims responsibility and has their own spin on this popular and traditional Scandinavian dessert. What makes it so unique is not only its flavor, but the elongated pan it’s baked in–it’s a beveled pan and each bevel is just enough for one slice. There are recipes out there for rum cake, but this isn’t a rum cake, it’s an almond cake with a rum glaze. Instead of using vanilla extract, like you would in a rum cake, this recipe calls for almond extract. 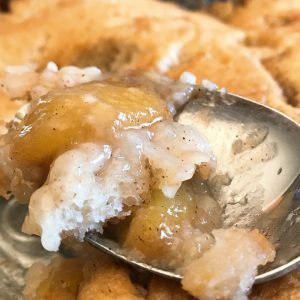 I remember watching my Grandmother make cobbler. She’d make peach, blueberry, and blackberry cobblers at the drop of a hat and with such ease! I’d be sitting on the counter-top, watching her mix the flour and other ingredients, waiting impatiently for that warm-baked-sweet-cobbler to be done so I could put a big dollop of vanilla ice cream on top and devour it before my Grandaddy came sniffing around in the kitchen. You see, he liked cobbler, too…and root beer floats. Every summer, I’d go to East Texas and spend up to two weeks staying with my Grandparents and hanging out with my cousins. Summer was different then. Maybe it’s because I’m older, or maybe it’s because summer really was different then. There was a real wooden picnic table out in the yard, under pecan trees. And there was a breeze. I don’t recall hosing down the yard with toxic chemicals so we could sit out there…we’d just take a newspaper, a watermelon, a salt shaker, a roll of paper towels, and a big knife…oh, and a fly-swatter. We’d have a good ole’ time! There was a water sprinkler we’d sometimes run through, and Grandmother’s garden we’d have to help tend to. We’d snap and shell peas, water tomatoes, and make pickles from the cucumbers she grew…endless fun in the kitchen! In the evenings, there were lightening bugs to catch, and sometimes, it would rain baby frogs. Seriously!!! Little bitty frogs that were about the size of a fingernail would come down with the summer rain! At night, we’d leave the windows open and be gently lulled to sleep by a breeze, the scent of gardenia’s, the sound of 18-wheeler’s rolling down Highway 42, and the occasional sound of a train rolling through a nearby town. The perfect backdrop for a peaceful sleep. I haven’t slept that well since I was last at their house, probably around 1991. My Grandmother Lucille (see Dedications) would have been 106 years old last week, on April 13th. I had planned to make her Fresh Apple Cake on her birthday, but reality intervened in the form of a baby copperhead snake sitting on my toilet that Friday morning. Nonetheless, we spent all weekend “de-snaking” our house and property. Now that’s over with I can resume my cooking. As usual, Lucille’s recipe was handwritten on a 3×5 index card. With No Title. 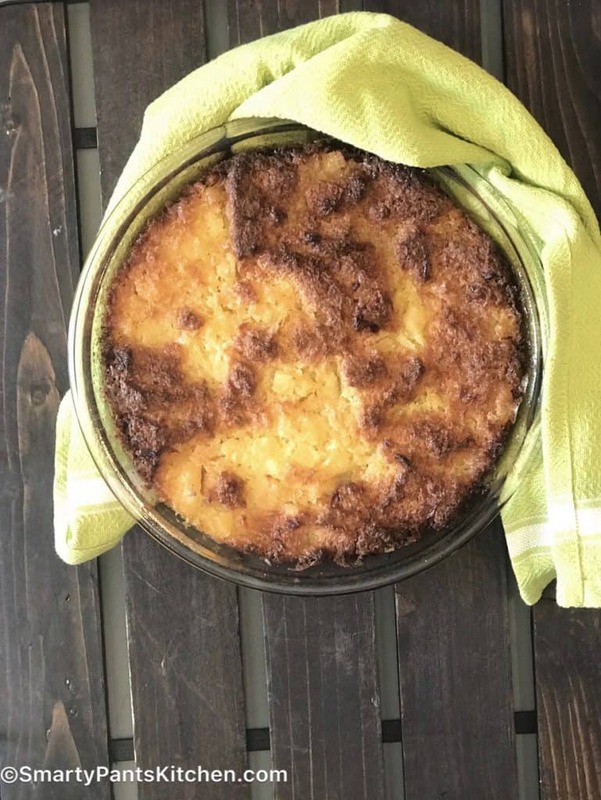 Pineapple Souffle is an easy recipe that goes great with a holiday ham, barbecue, or even as a dessert! The perfect side for your holiday ham! Sweet and fluffy, pineapple souffle can be served warm or at room temperature! This dish can be made in advance. To reheat, simply place covered dish in oven at 350 degrees for 30 min. 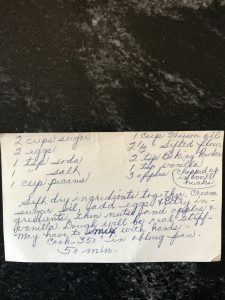 My husband’s family is of Scandinavian descent and I acquired this recipe years ago. I’ve been serving this light and airy almond cake for quite sometime and everyone always asks me for the recipe so, here it is! In a big bowl, combine sugar, egg, almond extract and milk. Whisk to combine. Add flour, baking powder and melted butter to the sugar mixture. Whisk to combine. Pour into greased baking pan and bake 40-50 minutes, until edges are golden brown. Allow cake to cool and make rum butter glaze. 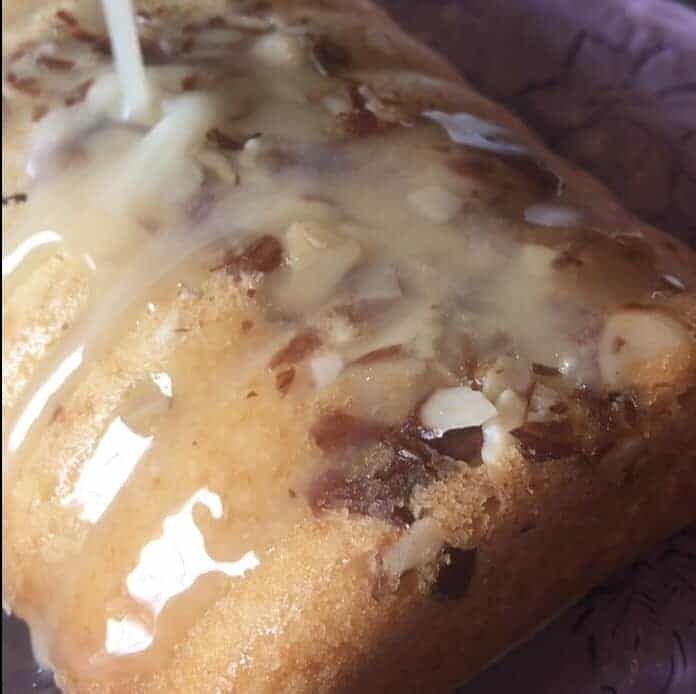 Turn cake out onto serving dish and drizzle with glaze. This cake is fantastic with or without the rum glaze and pairs well with raspberries or blueberries.